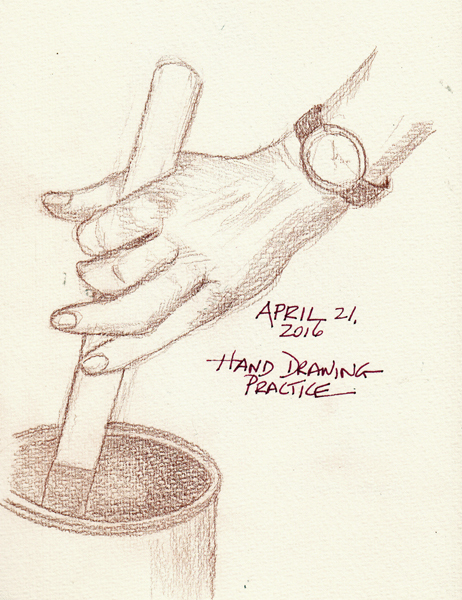 Danny Gregory taught me about comics in his opening week of Sketchbook School 6 - Polishing. As a child I read about Archie, Veronica, Betty, and Jughead. In college I read whole books of Peanut comics by Charles Shultz. In my adult years I read random strips of Cathy and Dilbert. Our first homework assignment was to draw a conversation as a comic. I thought about this assignment for a week while all of my ideas were almost instantly rejected. Then, as a second week began, I realized that the most important conversation was going on continually in my brain - between my Inner Critic and Me. My Inner Critic is not a Monkey - like Danny's new book tells us (Shut Your Monkey). Mine has always been an old lady - a very hypercritical old lady and many of the things she tells me definitely are based in comments from my Mother Marge and Mother-in-law Miriam. My college roommate had a similar Mother named Mildred - so I usually call my Inner Critic Mildred, so my name for her is not so obviously from my own Family. 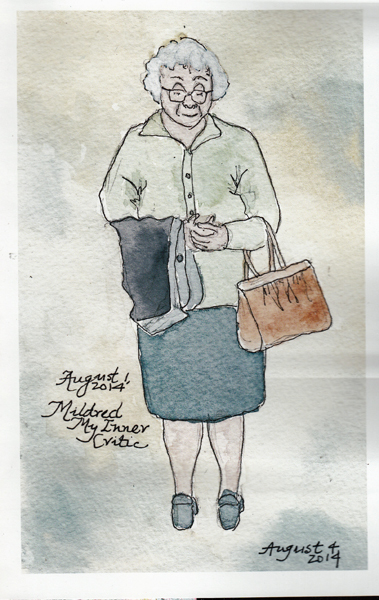 I painted my Inner Critic Mildred for an Everyday Matters Challenge in 2009. 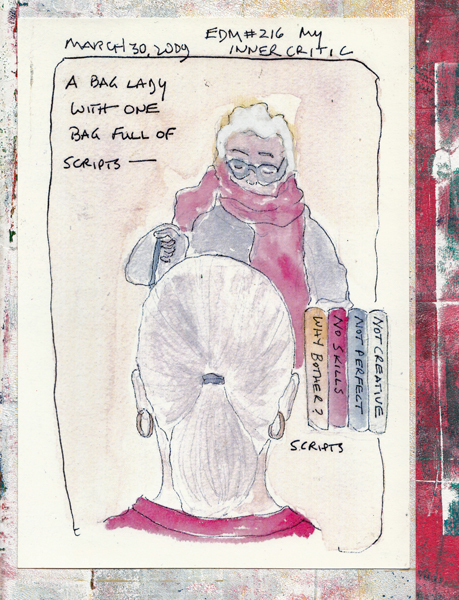 It is an old lady, and I called her a bag lady, with a bag full of scripts: "Not Creative," "Not Perfect," "No Skills," and "Why Bother?" "Why do you want to make that? What are you going to do with it? You will mess it up, and the whole thing will be ruined. It will never be perfect, so why try? You need to look for more information before starting. Besides, it isn't even an original idea." 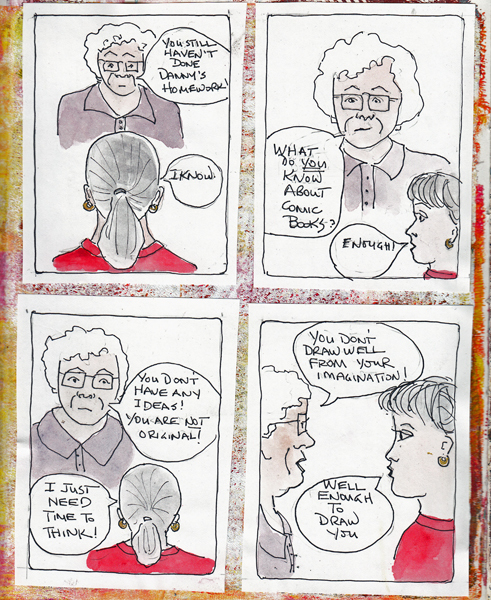 So here is my recent conversation with Mildred in a comic format! Critic: You still haven't done Danny's Homework. Critic: What do you know about comics? Critic: You don't have any ideas. You are not original. Me: I just need time to think. Critic: You don't draw well from your imagination. Me: Well enough to draw you! Critic: Other Sketchbook Skool (SBS) students are drawing great comics. Me: Mine will have meaning to me. Critic: Will they know who I am? Me: Inner Critic. I call you Mildred for hypercritical Marge and Miriam. Critic: I think you are wasting your time. Me: I'm playing now. Thanks for your concern. Our second homework assignment was to draw "a day in our life" as a comic. 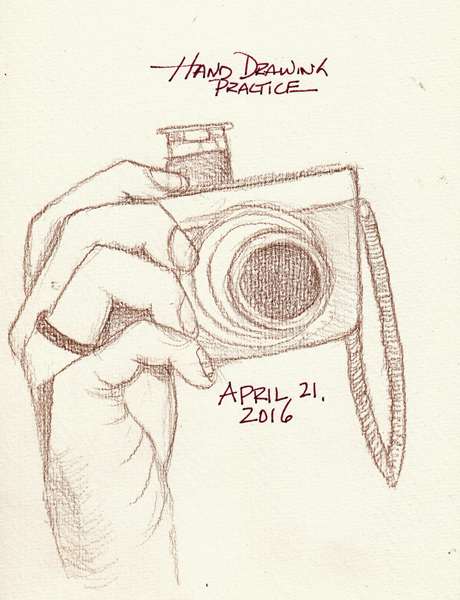 I love the Sketchbook School homework assignments and after fighting my Inner Critic when I'm out of my comfort zone, I do them. All except the original poster assignment from Jean-Christophe Defline. I'm still battlling Mildred about that one. All of the illustrations in this blog post are now the beginning of a book I hadn't used. 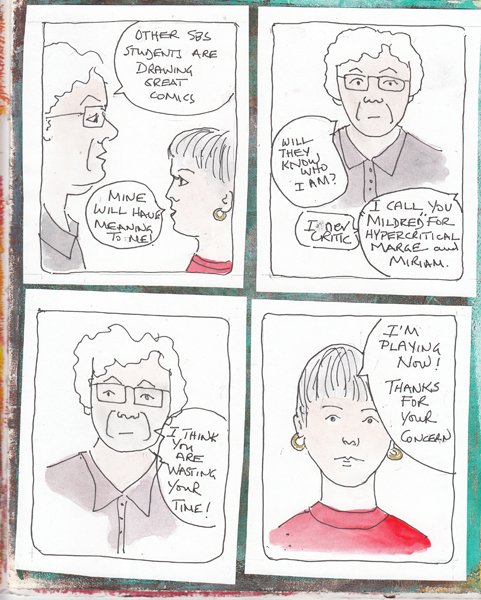 It should be fun to record my inner conversations and get them drawn on paper as a comic. 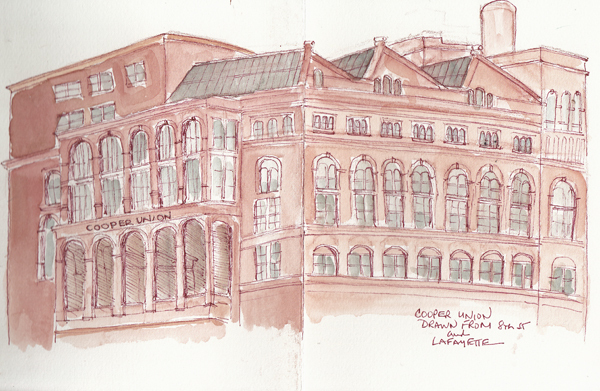 I went to the morning session of the weekend NYC Urban Sketchers for the second time, and in spite of early drizzle and rain, I really enjoyed sketching Cooper Union. It is a major historical building in the City and I hope that I can draw their other building which is very modern sometime this summer. "The Cooper Union for the Advancement of Science and Art, established in 1859, is among the nation's oldest and most distinguished institutions of higher education. The college, founded by inventor, industrialist and philanthropist, Peter Cooper, offers a world-class education in art, architecture and engineering as well as an outstanding faculty of humanities and social sciences. Peter Cooper wanted his school to play a role in the political and cultural life of his city and country. The means he chose was the establishment of the Great Hall in the basement of the Foundation Building. It seated 900, the largest secular meeting room in New York and soon after it was opened, and it made history when Abraham Lincoln, an unannounced candidate for president of the United States, and a virtual unknown in New York, was invited to speak there by the Young Men's Republican Union." 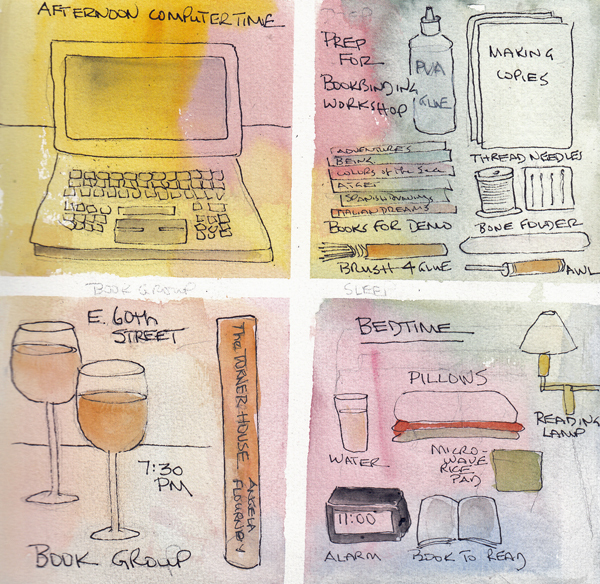 I sketched this across two sections in my most recent handmade accordion watercolor journal, and I love that the previous two are filled with outdoor paintings done with the weekday Urban Sketchers over the last two years. This is the current watercolor book. 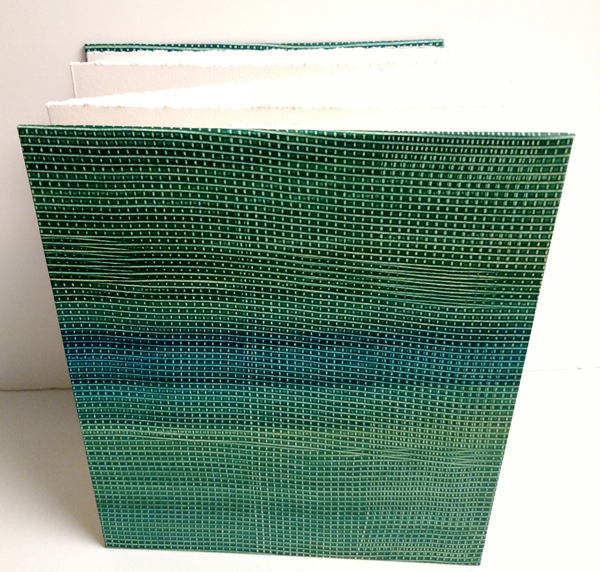 I used Fabriano Artistico 140 lb watercolor paper for the 8 panel strip and paste paper from my last production for covering the binders board. I can draw and paint on both sides of every panel. This is an example of the first and second accordion sketchbooks I filled at Urban Sketchers Weekday sessions. 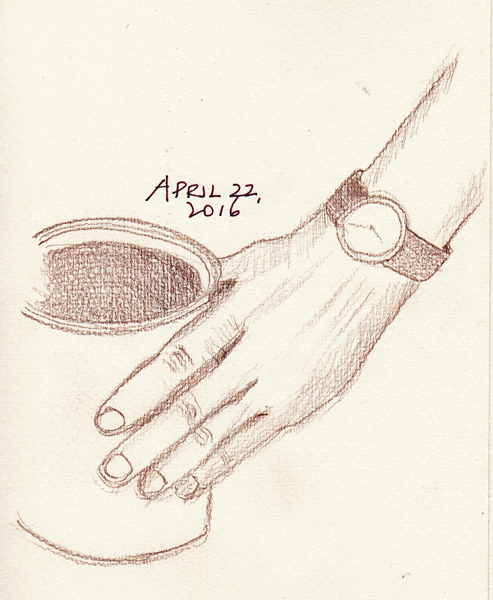 The Battery Park Conservancy outdoor free drop-in art sessions will begin again the first Wednesday in May, and that always inspires me to work on my hand drawings. I attend on Wednesdays, weather permitting. In the morning the group and artist administrators are in Wagner Park from 11-1 and the gardens, NY Harbor, and the Lower Manhattan skyline are all wonderful subjects. In the afternoon they reassemble in the South Cove for clothed figure drawing. These 3 drawings were done with a watercolor pencil, without water, using hands from magazine advertisements. 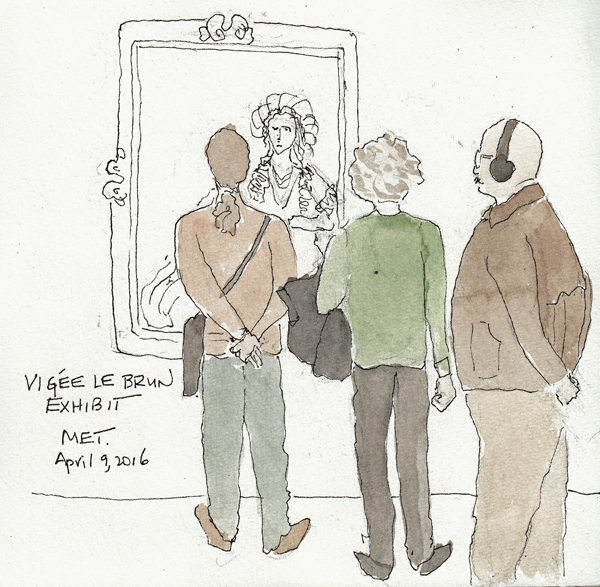 The NYC Urban Sketchers met at the Metropolitan Museum of Art and I saw, and sketched, in the Vigee LeBrun exhibit which closes on May 15th. 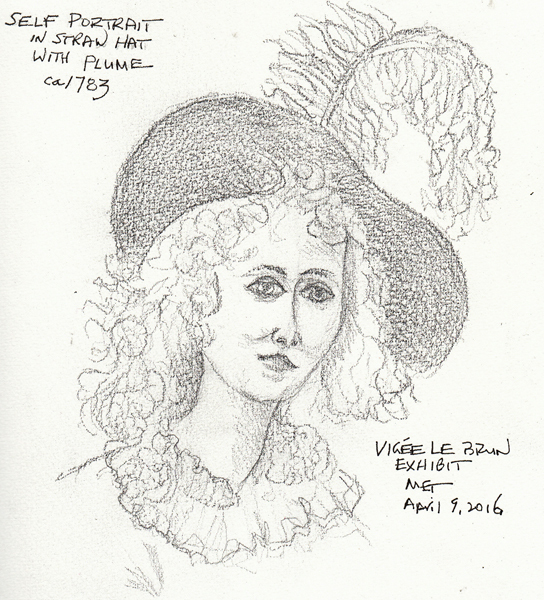 "Elisabeth Louise Vigée Le Brun (French, 1755–1842) is one of the finest 18th-century French painters and among the most important of all women artists. An autodidact with exceptional skills as a portraitist, she achieved success in France and Europe during one of the most eventful, turbulent periods in European history." She is known as the painter to Marie Antoinette. I sketched a sculpture of her by Augustine Pajou, viewers in front of one of her paintings, and a Self Portrait before the group met for lunch. I was most struck by the fact that most of the women in her paintings had her face! 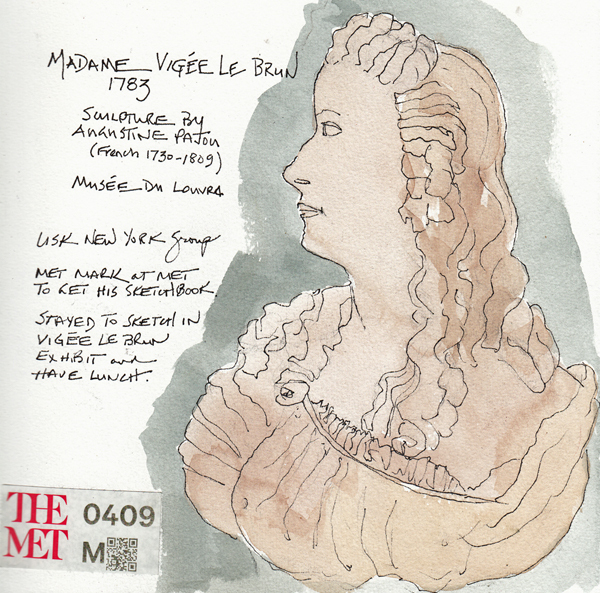 The Met has most of her portraits at the link listed above. I went with my artist friends to see the Andy Warhol exhibit at the Morgan Museum and Library, which also closes on May 15th. I don't care if I ever see any more of his silk screen art, but I love his work as an illustrator - especially his blotted line drawings which I wrote about during his exhibit last summer at MoMA. 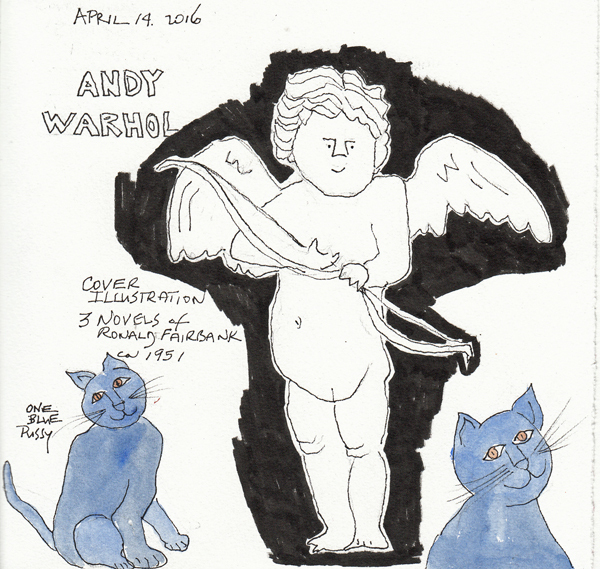 "Andy Warhol’s fascination with publishing and the art of the book was lifelong—rooted in his artistic training as a college student and early career in advertising, fashion, and commercial illustration. For close to forty years, books were a touchstone for Warhol—a medium to which he returned again and again as a platform for his unparalleled creativity. He contributed to more than eighty projects for books and left traces behind of dozens of others that were never realized." I sketched one of his illustrations, but I'm also posting my illegal photo of my very, very favorite painting. It was an illustration from a Katherine Ann Porter book called Old Mortality. Many of his drawings/illustrations are best seen on a Pinterest Board. 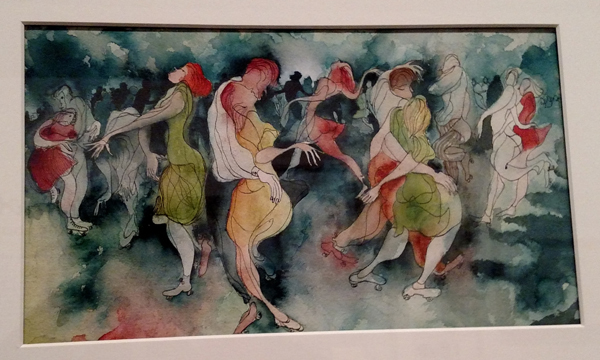 This ink and watercolor painting is called Figures Roller Skating (1946-47). The lines are so amazing and the colors so rich. I haven't found an image of it yet online. 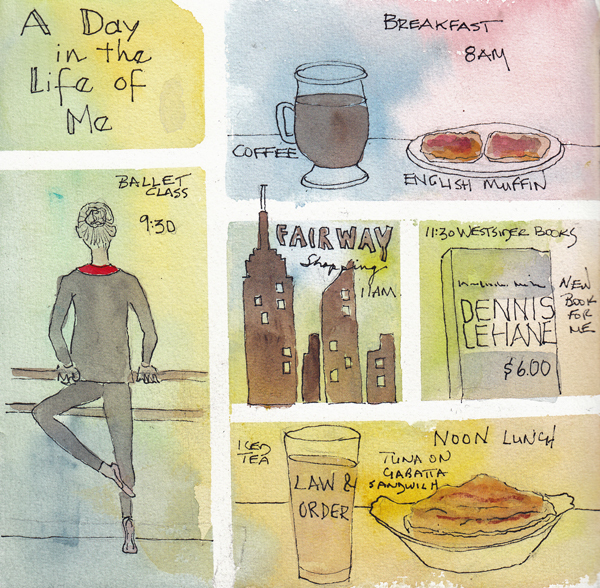 When I restarted drawing, and learning about watercolors, I was most interested in documenting my life by drawing and painting in sketchbooks. I've now filled over 100 since 2005 and I love how much I remember about events when I browse through them. This semester I'm taking an abstract painting class using acrylics, at Fashion Institute of Technology (FIT) and was attracted to the course just to shake up my painting - not to switch my focus or medium. Our first painting was "non-objective" meaning that it was not based on anything in reality. 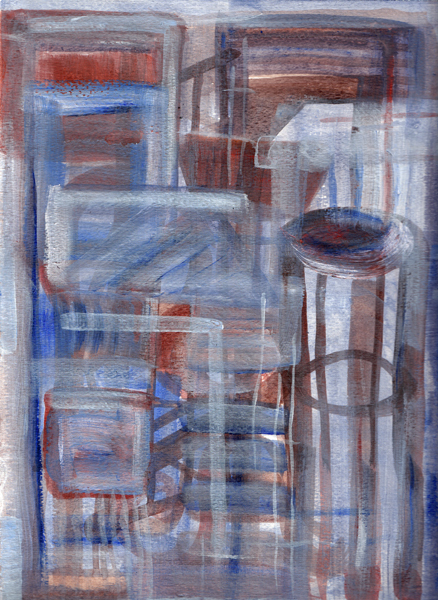 The second painting was "objective" meaning that the artist begins with some images from his/her environment and then proceeds to abstract the image. 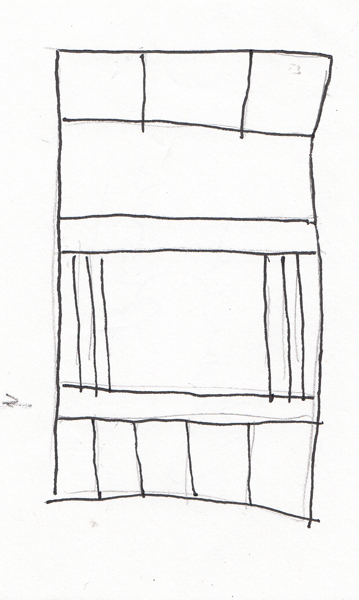 I like grids and quickly sketched a media wall in front of me as I sat reading. 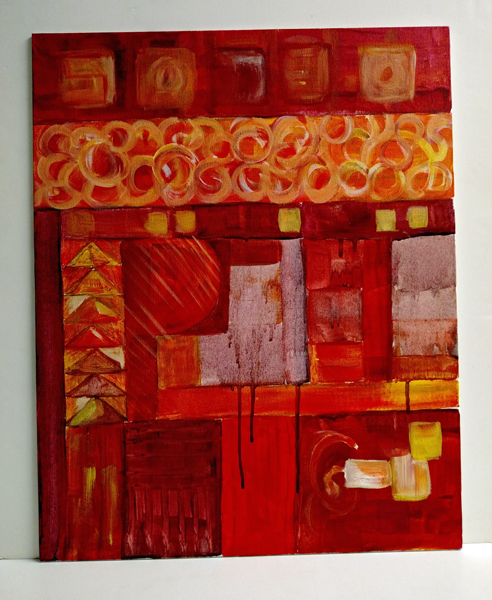 My first painting in the course was in cool colors and I wanted to make this one in hot colors - and I added layers to the 16 x 20" canvas panel over 3 weeks. This is my finished painting. After I completed this painting I quickly painted some of the things in our class studio - a stool, a high chair, an easel, a ceiling exhaust fan, and a wood stand that holds our paints, palettes etc. Many of my classmates used the studio as their inspiration and I decided to try it as well. I painted multiple layers on a 9 X 12" piece of watercolor paper, and this is the result. 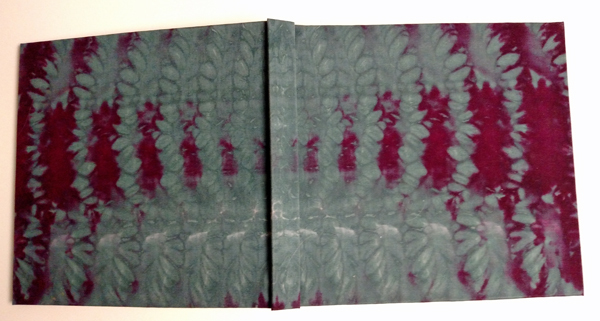 I dye fabric for a variety of projects, including bookcloth for my handmade watercolor sketchbooks. Most of the fabric designs are abstract, and it took me weeks to realize this similarity to my painting class. This is my newest watercolor sketchbook - made with a piece of fabric that was tightly rolled and tied in a knot before soaking it in an equal mixture of red and black dye stocks. The design and colors were a complete, and wonderful surprise. 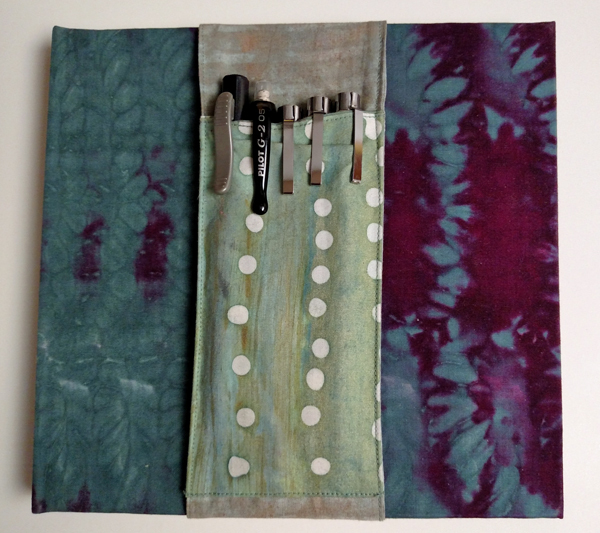 I designed pen pockets for my sketchbooks this year and distribute Sewing Instructions if requested on my blog. I have enough dyed fabric that I can make pen pockets to blend with the covers, and I'm able to use a similar color pocket with the new sketchbook. This is the new sketchbook and pocket - and below this photo are others that I made for prior books. Please leave a request for the pattern PDF on my blog.